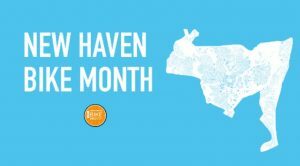 New Haven residents and bike-afficionados gathered at the Bradley Street Bicycle Co-op from 6 to 8 p.m. on [April 19] to celebrate the launch of the third annual New Haven Bike Month. Caroline Smith, a co-organizer of New Haven Bike Month, kicked off the month with a launch event that included food, speakers and community art. The launch featured bike portraits by “Faces of Cycling,” a project partnering with New Haven Go that highlights the diversity of cyclists in the Elm City. Once the annual bike month officially starts in May, events will include various open street events, bicycle clinics, prize giveaways and other celebrations of biking culture. “At its core, its main mission is that every single person stays excited and empowered to ride bikes,” Smith said.